Recipes were one of my last holdouts in switching to a paperless lifestyle. In our kitchen we had a cabinet full of old cookbooks and loose recipe papers. For years my wife would tear pages out of food magazines and stack them up in this cabinet. Every once in a while we would reach for a cookbook and everything would come crashing down on the counter top. Let alone the fact that it was almost impossible to find the recipe we wanted in that overstuffed hodgepodge. I wanted to find a solution that would wrangle all our recipes in an organized manner on the iPad, and I think I did. The entire process relies on apps from Evernote. This is a great service that allows you to keep PDFs in the cloud for easy access on all your devices. Unlike Dropbox, which is more of a cloud-based storage system, Evernote focuses on, you guessed it, notes. You can send practically any type of document to Evernote and it will become an editable note. Then you can view and edit these notes with Evernote’s desktop and iOS apps. To begin, you’ll want to download these apps on your devices and create a free Evernote account. Next, create a folder in Evernote called Recipes and set that as your default folder which new notes will be created in. Now lets look at getting those recipes into Evernote. For the loose papers and books, scanning is the way to go. My preferred scanner is the much praised Fujitsu ScanSnap S1300i. 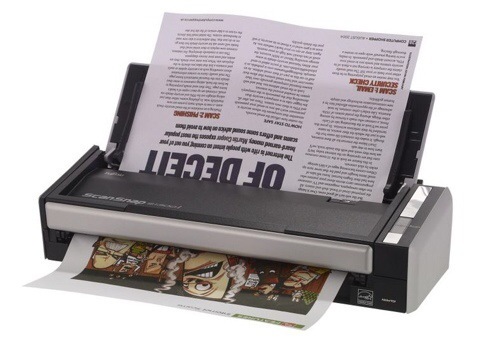 This is a double sided feed style scanner. I love it because I can lay a stack of loose sheets in its tray and each will be automatically fed through and converted to a PDF. So all those torn out magazine pages can be quickly scanned with optical character recognition (OCR). This is important because Evernote will then be able to search your scanned PDFs for ingredients in your recipes.The ScapSnap desktop software includes an option to scan to Evernote. So once you’ve got Evernote installed on your desktop, your scanned PDFs will be automatically uploaded. Once uploaded to Evernote, you can properly name the recipe. Another option for scanning these loose pages or even ones in your cookbooks is Smile Software’s PDFpen Scan+ iPhone and iPad app. Smile apps are known for their awesome OCR capabilities, and PDFpen Scan+ doesn’t disappoint. With this method, just launch the app and point your iPhone or iPad camera at the loose sheet of paper. PDFpen Scan+ will find the page edges, create a PDF, OCR it, and then upload it to Evernote right within the app. This process works great if you have just a few loose recipes and don’t want to spend a ton of money on a stand-alone scanner. The video above shows just how to do it. What about the recipes that you find online? Can those be organized right along with your other scanned recipes in Evernote? They sure can. This involves a neat feature of Safari on your iPhone and iPad called extensions. Now with the Evernote extension, you can save any webpage as a PDF to your Evernote account. Just find the page you want, tap the share button, tap the Evernote icon, and you’re ready to save the page to any folder you choose in Evernote. The image below explains how to enable the Evernote extension. You can also watch a video of how to do this here [Link]. Safari’s share button now reveals two rows of icons. The upper one shows the Sharing options whereas the lower displays Action icons. 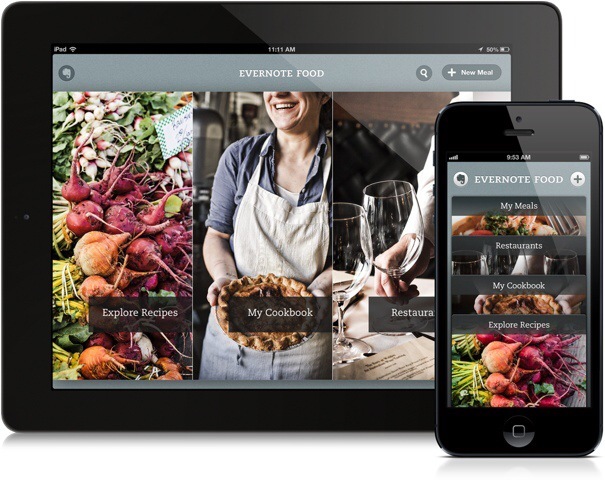 Now that your recipes are all in Evernote, the best way to view them is with the Evernote Food app for iPhone and iPad. 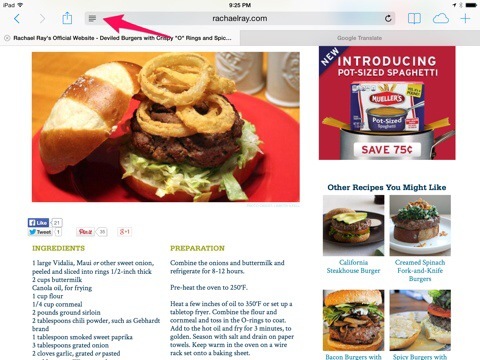 Evernote Food lays our your uploaded recipes in a great searchable layout under the My Cookbook tab. There are other tabs that let you find new recipes online, find restaurants, and even take pictures of your favorite “food moments.” The app especially shines on iPad with a beautiful tile layout. I wish Evernote food included a browser so you could visit any website instead of their curated lists. But in the meantime, the EverClip app will have to do. 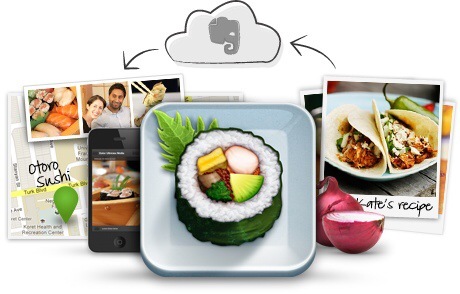 For getting all my loose recipes into a paperless workflow, Evernote seems to provide the best solution. While it would be great if their iPhone and iPad app included the abilities to scan, OCR, and clip webpages, I’m glad that there are other apps that will accomplish the task. We’ve compiled the apps you’ll need below. So take a look and if you have another paperless workflow you use, we’d love to hear about it in the comments.